I was pretty excited last night as word started swirling around about some awesome Twitter news. Ultimately, that news was that Twitter.com was getting a new layout and making it easier to view media in your stream. And profiles are easier to see now, too, it seems. Overall, everything looks great. They should be proud of their work. It’s a big step for the site. My big problem is that all of these updates do nothing to help me better use Twitter the way I use it. For me, Twitter is information and conversations. I don’t need another site to go to. I need the information being transmitted across Twitter by the people on Twitter. Twitter.com gives me lots of new options for looking at replies, direct messages, and so on, but they’re all accessed through a new tabbed-like interface. I have to go to the site and click each tab individually to see what’s going on. I use TweetDeck to manage four twitter accounts and all of the information associated with them. To do this with the new Twitter, I’d be spending my days logging in and out, in and out. Constantly. And once logged in, I’d be clicking tabs left and right to view things like mentions, searches, etc. The amount of work that would go into browsing the information I look for would go through the roof. TweetDeck gives me all of that information in a single window. No window-dressing. Just important information. Twitter has never been about media consumption for me. I use Twitter as a tool to enable me to have a conversation with the world. I don’t want Twitter to be more like Facebook. I want it to make it easier for me to parse the high volume of information I go through daily. Until then, I’m sticking with TweetDeck. PS. 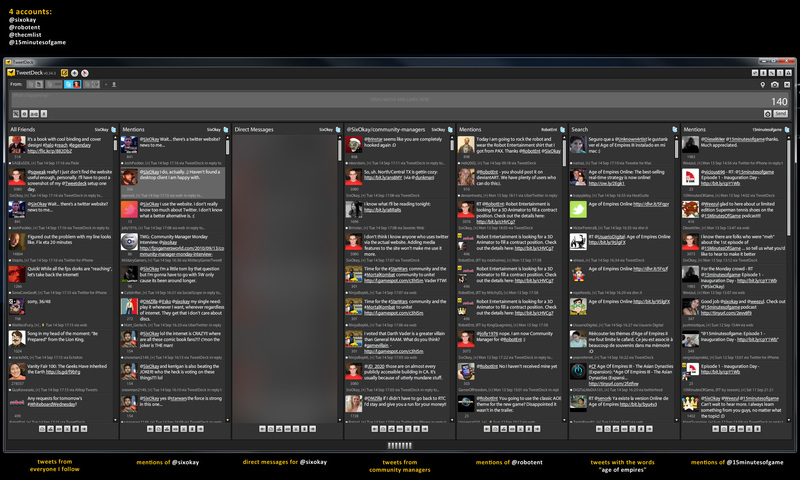 I also manage the same four accounts and 7 (sometimes 8) columns on my TweetDeck app. Very well said Justin. My Twitter updates my Facebook but I view them as completely different resources and use them for different reasons. I use http://www.cotweet.com and love it. I used to use it and liked it a lot, but I don’t like that it’s web-only. I want an independent desktop app.